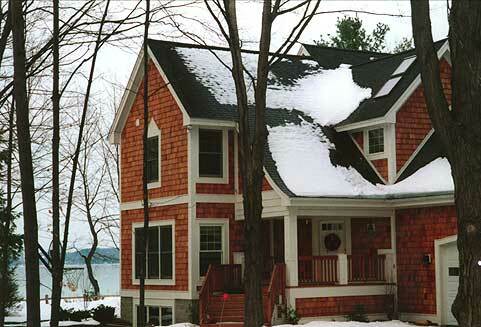 With large windows placed to take advantage of multiple views from almost all the rooms, this beautiful shingle–sided home is equally at home on a waterfront lot or on secluded wooded acreage. 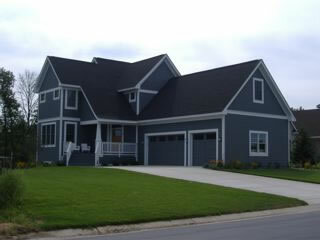 This house has three bedrooms on the upper level along with room for a fourth over the garage. 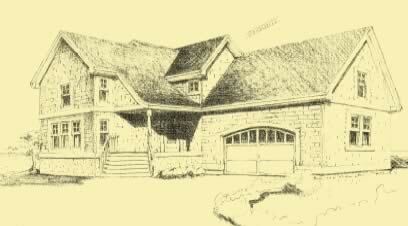 With its angled front entry placed towards the center, this house can be oriented in a number of directions to suit your view or your lot. 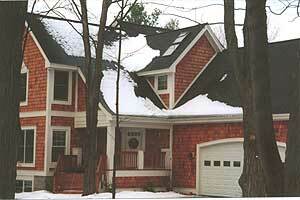 The roof over the covered entry porch is distinguished by a small curving lip at the end. 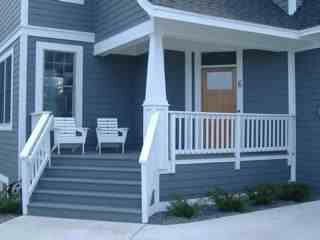 The stairs up to the porch, and the inset wall with the front door, are set at 45 degrees to the rest of the house. As you enter, there are stairs to the upper level on your right, a guest bathroom next to the stairs, and a coat closet to your left. Just past the closet is an opening to the living room. This room features views in three directions, and like the rest of the main level, it has an impressive 9' ceiling. 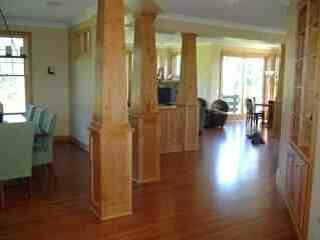 Open to the foyer, but visually distinguished from it by round wood columns and wood beams, is the dining room. An entire wall of windows in this room provides great views and light. Located just beyond the dining room are the family room and the kitchen. The family room also has an entire wall of windows, and sliding glass doors on an adjacent wall open to a deck or patio. There's also a large fireplace in the corner. A large free standing counter with an eating/serving bar separates the kitchen from the family room. 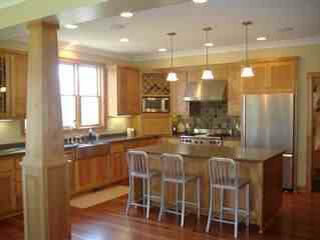 The kitchen also has a large center island, plenty of counter and cabinet space, and a trio of windows over the sinks. 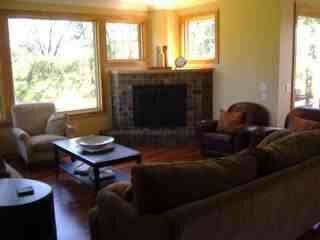 Next to it and the family room is a charming nook that's wrapped with windows and sliding glass doors on three sides. Just off the kitchen is a short hallway that accesses a mudroom, the powder room, stairs to the optional lower level, and a two–car garage. At the top of the stairs to the upper level there's a door that opens to the laundry room. Just to your right there's another door that leads to an optional bedroom with its own full bath. The landing at the top of the stairs provides access to three bedrooms and a private study. 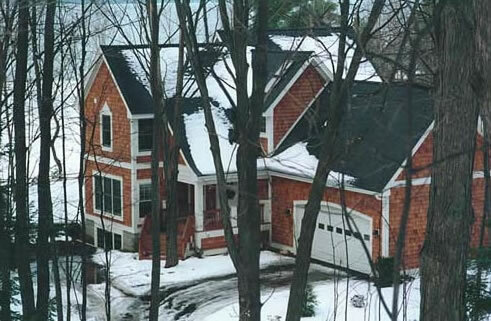 One short hall leads to bedrooms 2 and 3 and the bathroom they share, while another leads past the study to the master suite. 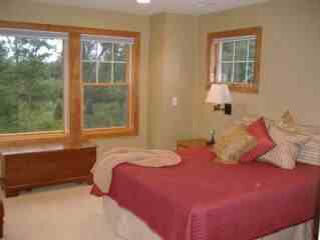 The master bedroom has a ceiling that vaults to nearly 13', and one long wall of windows for views and natural light. Windows on the two adjacent walls expand the view. The master bath has a large tub beneath corner windows and a private toilet and shower, and next to it is a large walk–in closet. 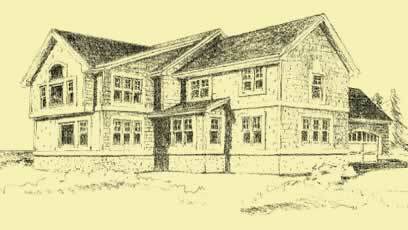 There is a slightly smaller version of this plan – Bay Wood 2 – that is available on this website. For easy access to this other version, click on the Architects button on the left side of any page in our website, and scroll down until you see Ed Kriskywicz's name and photo. Red links to each of his plans appear below his bio. The main level of this handsome home features a large family room off the kitchen, along with separate living and dining rooms, while the upper level has three bedrooms (plus an optional fourth above the garage) along with a study and a laundry room. 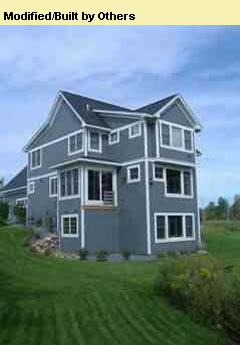 There are great views to the front, the rear, and one entire side, so the house is filled with light during the day.